As a landlord, it is inevitable that you may encounter a tenant who keeps breaking rules or paying rent late. 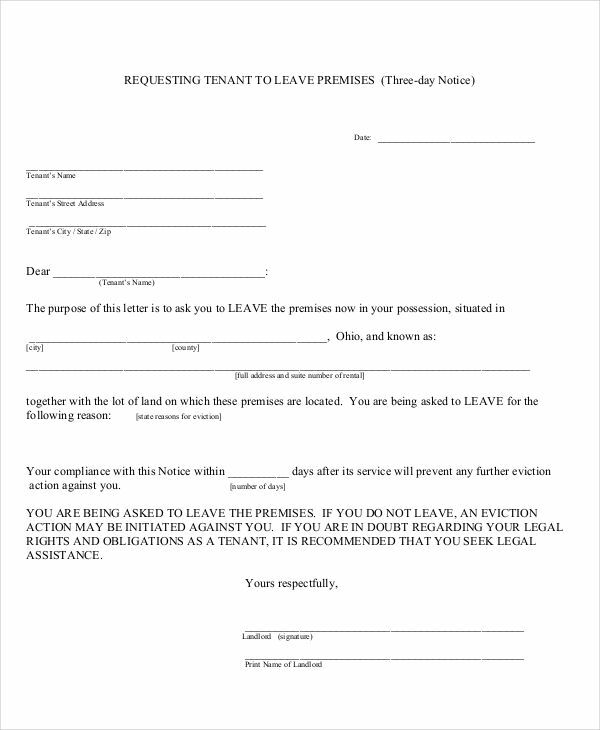 You don’t want to terminate that tenant immediately or force a tenant eviction notice because that might hurt your reputation. Solution? 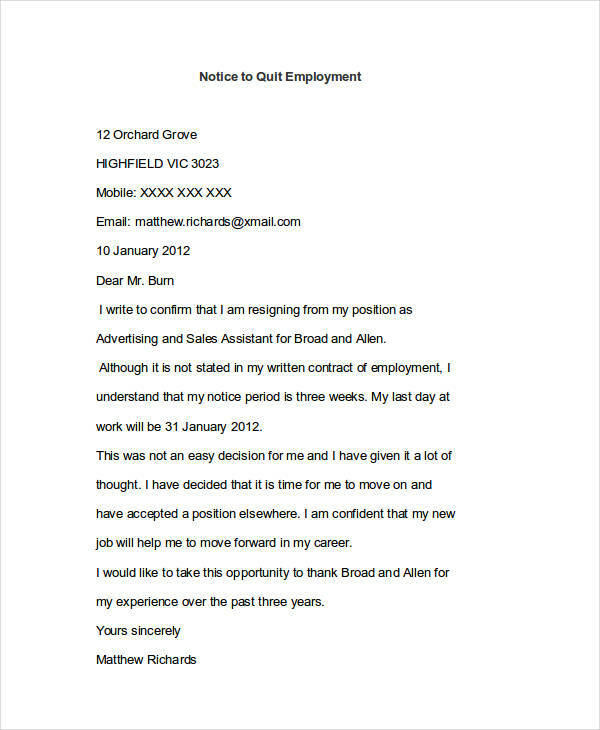 Provide a notice to quit. This notice works in a workplace as well, where an employee may decide to draft a notice to quit before handing in their resignation letter. Not only do they know that it is improper to quit without notice, but it is often required to provide a sufficient heads-up before their impending decision. What Is a Notice To Quit? 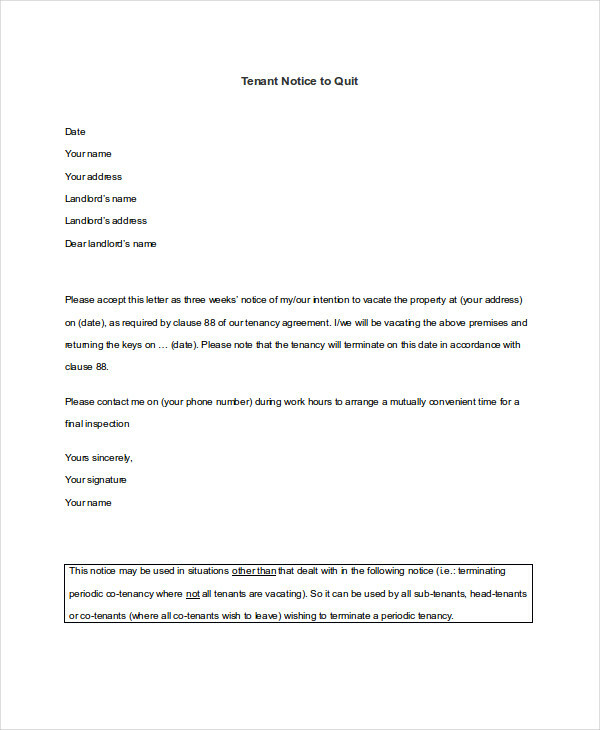 Commonly, a notice to quit is a notice from the landlord that informs tenants to vacate the premises within a specific period of time. 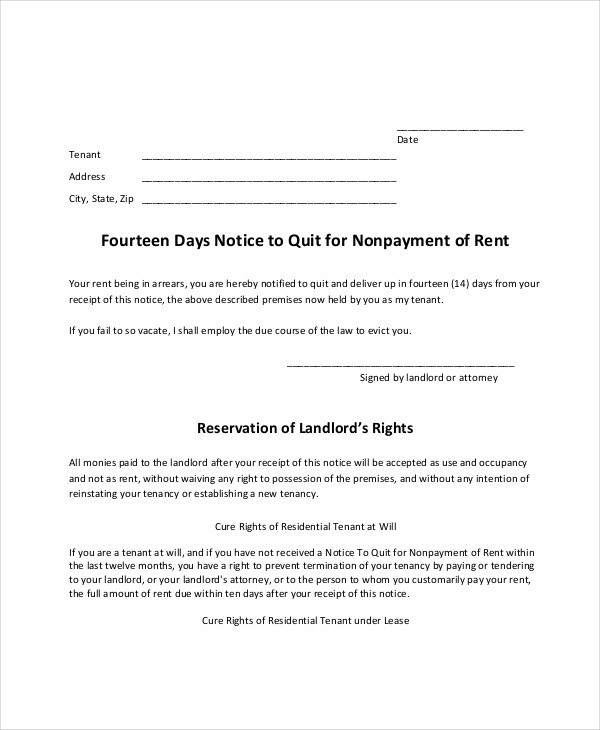 After the landlord issues this notice to quit, it will eventually be followed by a 30-day notice the tenant will have to sign, agreeing to leave on or before the 30 days are up. 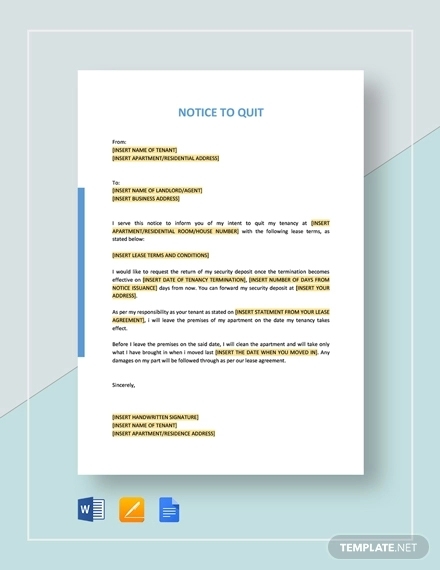 However, a notice to quit is also now used by the employees informing their boss that they decided to leave or quit their current job. 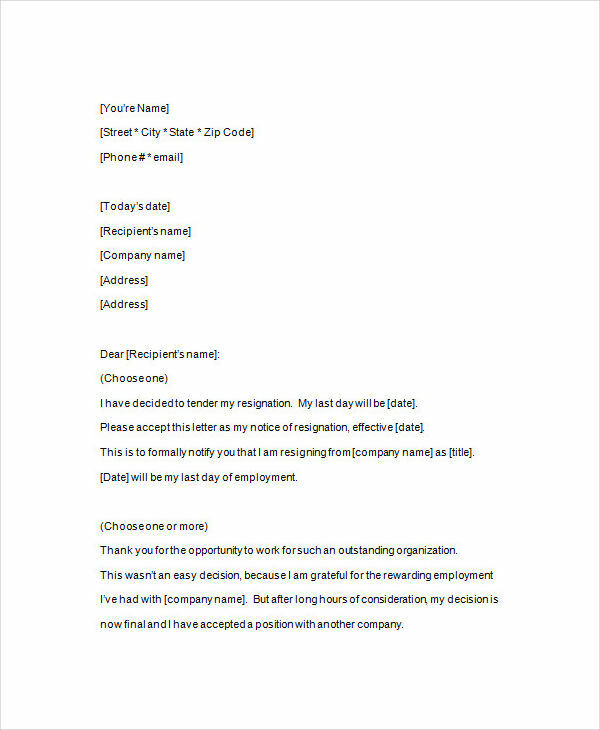 If you are an employee and decided to quit your job, give your boss a two weeks notice letter to preserve a positive relationship with your boss. Evicting someone or quitting a job is a tricky task. 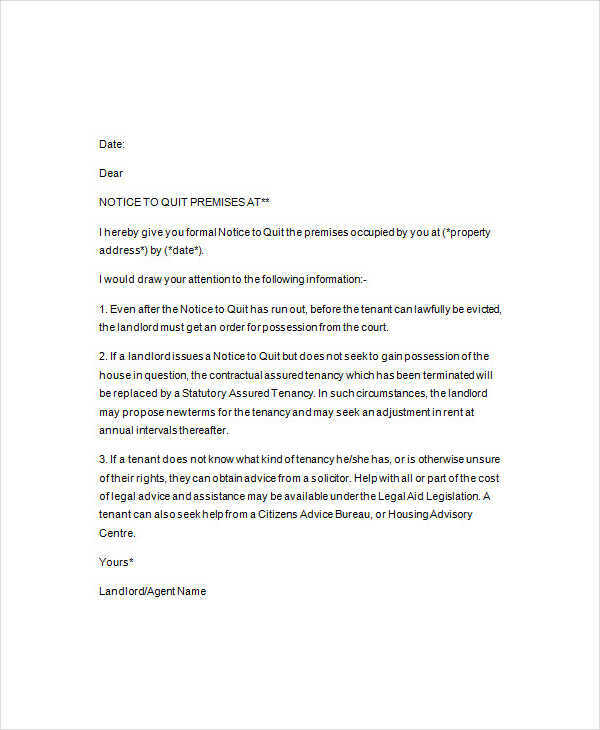 It may be easier if we use a tenant quit notice it will also be hard if we don’t know what to write in our notice to quit. Luckily, this article provides samples of free notice to quit to make our writing easy and simpler. But that’s not just it, these samples have numbers of benefits if you go and use these. These samples will reduce your workload. You don’t have to think deep anymore on what to write in a notice to quit. You just have to focus more on your reasons. The important details are already outlined and laid out in these samples. You don’t have to worry if you are writing your free notice to quit accordingly or not. These samples also present the information in a sequential manner so that no important information will be missed out. These samples used formal and easy-to-understand language that can be understood and comprehend by almost anyone. You can also use these samples as your guidelines if you want to make it on your own. It’s win-win. And the best part? These samples are in PDF and .doc format so that you can download and read it easily. You can also browse our formal notice and free notice examples to give you more idea about different kinds of notices. Can a Company Fire You after a Notice is Given By You ? 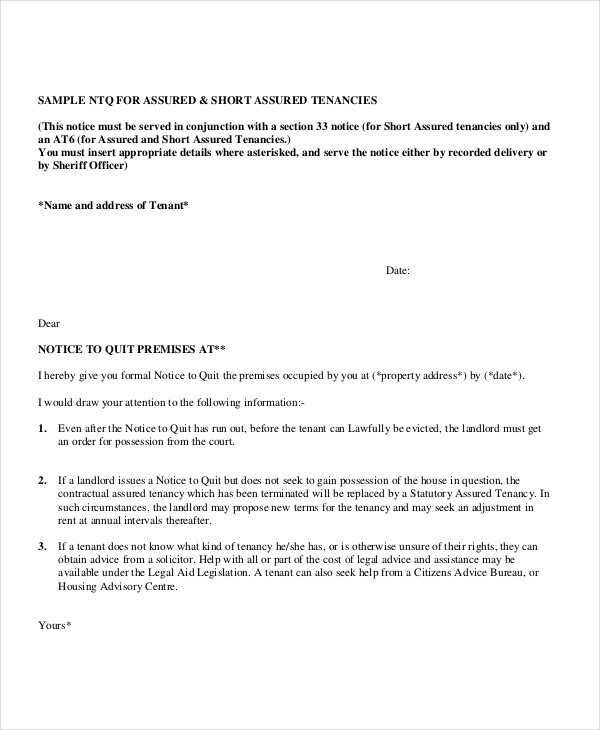 What Is a Tenant Quit Notice ?